Closer to Our Goal – and Nearly Ready for Construction! DCC: Already a Big Difference! Summer in Western Alaska is very short, but through your support, we're doing all we can to make the most of it. In July, our skies never get dark – the midnight sun persists well into August – and as you'll read in this issue, we're putting our warmer temperatures and endless sunshine to good use. This month, on July 14th, KNOM will mark the 41st anniversary of its very first broadcast. We'll celebrate our birthday, in part, by making final preparations for the beginning of construction on the Tom and Florence Busch Digital Studios. As you'll read below, the generosity of so many people is making possible this exciting and vital renovation project, and we hope to break ground in just a matter of weeks. In this studio project and in so many others, we are standing on the shoulders of countless supporters, volunteers, community members, and staff. As you'll read below, our dedicated volunteers continue to reach out to the villages we serve by visiting them in person. 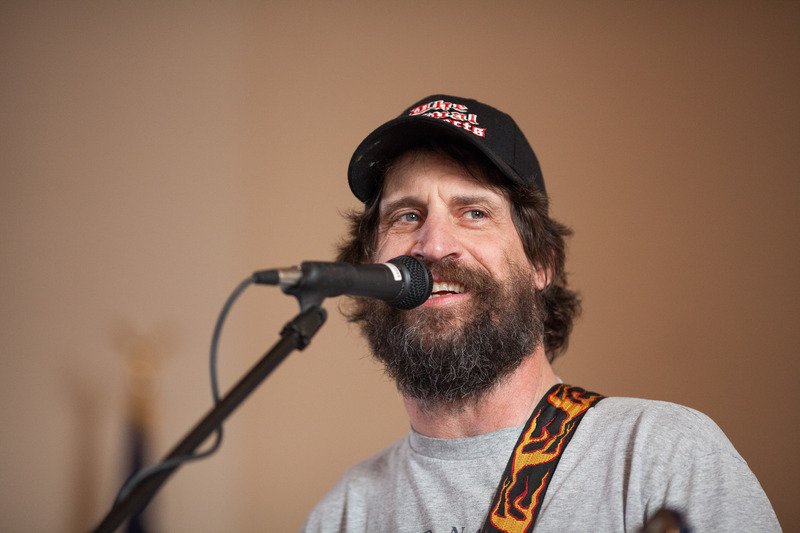 Also below, you'll find information on the incredible community event that brought Nome together in support of our mission, as well as the latest activities from two of our KNOM board members, both of whom serve our local Catholic community. Our issue concludes with stories on our equipment: both new technology that's already saving us money, and old technology that, through a community initiative, we responsibly recycled last month. Thank you for helping us serve Western Alaska for 41 years – and for helping us lay the groundwork for decades to come. 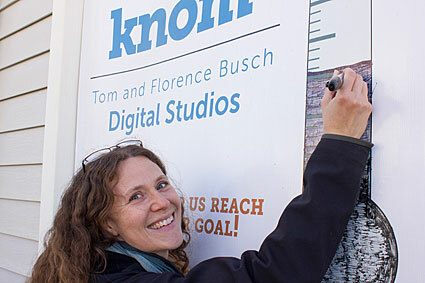 We offer special thanks to the many supporters, community members, and listeners who have contributed to the fund for the Tom and Florence Busch Digital Studios: a crucially-needed construction project that will both expand our studio space and renovate it, replacing our aging, analog technology with more cost-efficient digital hardware that will be far easier to maintain. We're so grateful and excited to report that our dedicated studio funds now exceed $313,000 – thanks, in part, to a series of matching challenge pledges from a few generous donors. 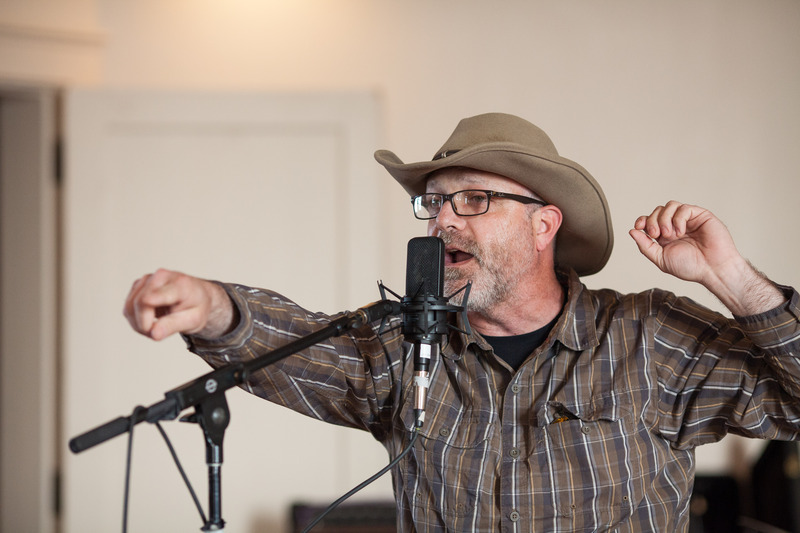 The first such pledge matched, dollar for dollar, $50,000 of the studio funds we received. In late May, this $50,000 goal was met, at which point a donor offered another matching pledge of approximately $30,000. Through this pledge, about the next $30,000 we receive will be doubled through a dollar-for-dollar match. Thanks to you, we're getting closer to our phase-one fundraising goal of $600,000. 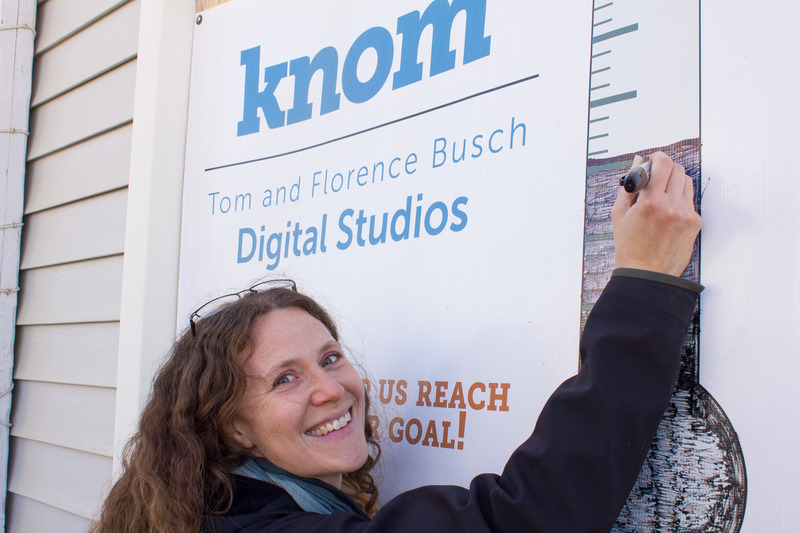 Thanks are due, also, to a special community event (described below) spearheaded by Nome resident Sarah Hofstetter, who is pictured above filling in the fundraising thermometer outside our studio building. 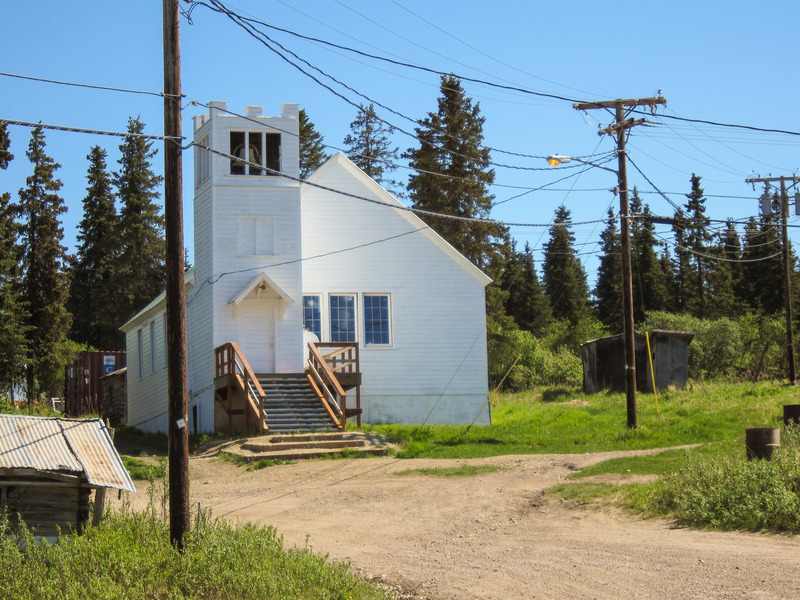 To take advantage of Nome's brief building season, we hope to begin construction on the studio annex on August 1st. You made it possible. Thank you! Trust the past to God's mercy, the present to God's love, and the future to God's providence. 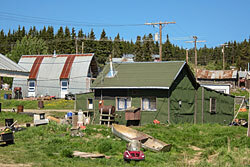 The villages of the Alaskan bush are the heart of our mission. 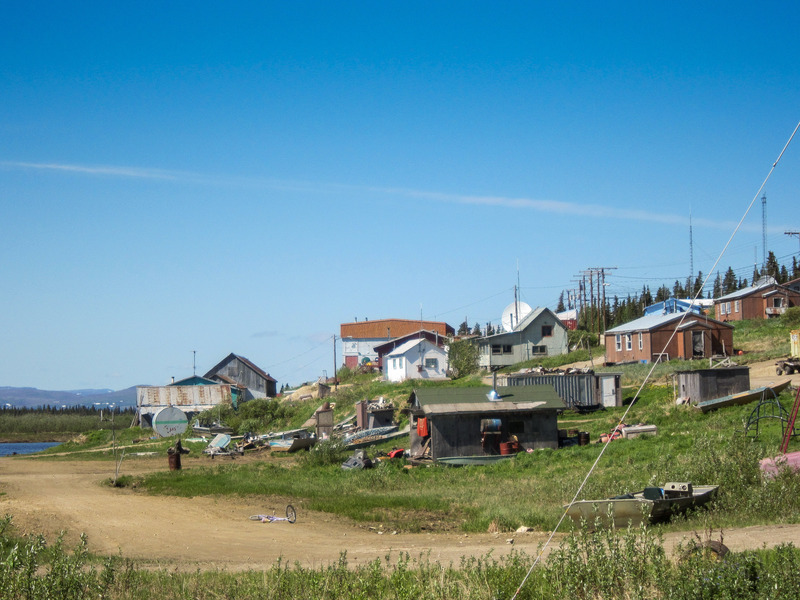 The isolated communities that surround Nome are the home to the majority of KNOM's listeners, and they are the places where traditional Alaska Native culture remains a vibrant part of daily life. Thanks to you, we do all we can to serve Western Alaska's villages, and that often means sending our wonderful volunteers to visit them in person: to talk to their residents, to report on their events, and to gain a perspective on their lifestyles and their challenges. 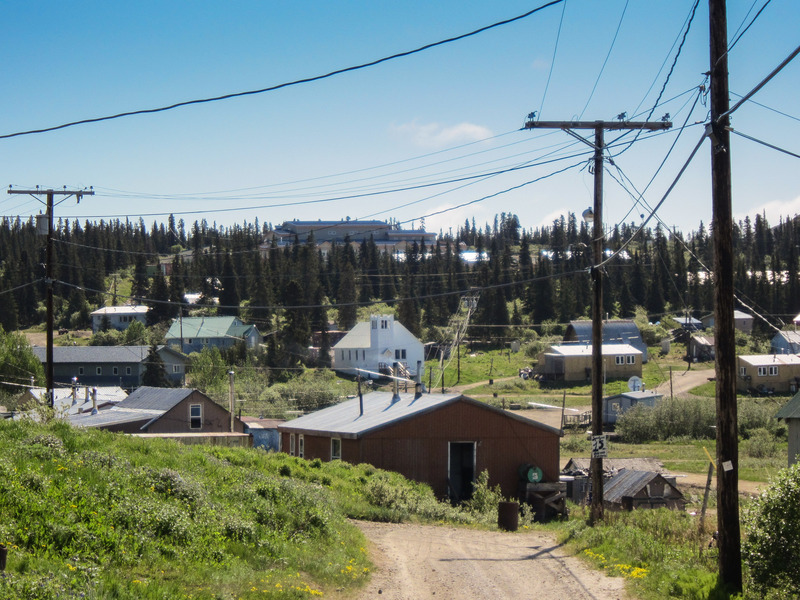 I had the opportunity to travel to the village of White Mountain and work on the next edition of my show, Village Detour: a program dedicated to the song requests and native music of the people living in a particular community. 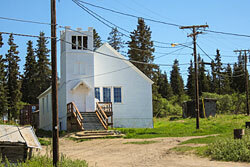 The people in White Mountain were amazingly welcoming and happy to see me and participate with my project. The weather was great: it was a bright sunny day with a cool breeze that kept the mosquitoes to a bare minimum. However, what really grabbed my attention were the trees. 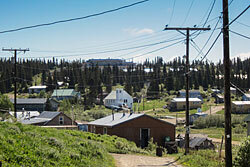 Nome is north of the tree line and doesn't have trees, but White Mountain has forests of them, mostly evergreens. It was gorgeous. I spent my time in White Mountain walking around the village and talking to people about their favorite songs. 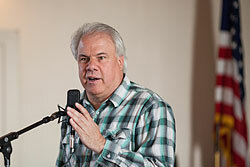 Most people were really excited to have the opportunity to hear their own voices on the radio. A second adventure came on the way back from White Mountain. As our small plane approached Nome, the pilot told us that the city was fogged in and that we couldn't land there. 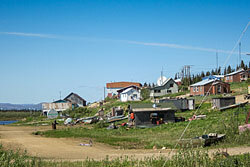 We had to land on a dirt landing strip on the outskirts of town – about 20 minutes away from Nome – then wait for a bus to come and pick us up! It was a rather funny ending to a pretty awesome day. To read more about Rebekah's trip – and to read other stories of our hardworking volunteers – explore our new volunteer blog (at blog.knom.org). 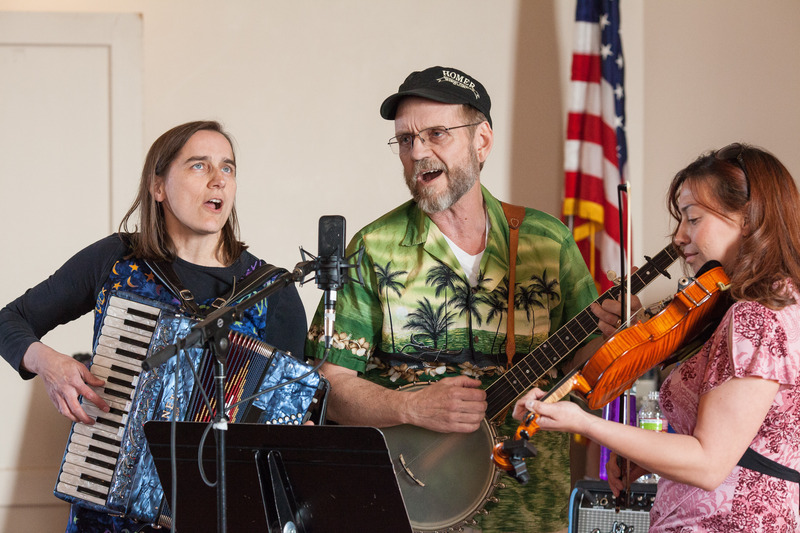 Every day, KNOM's programming offers a wide diversity of quality music for its equally diverse listeners, so it's perhaps fitting that the first-ever benefit concert for KNOM Radio showcased a cross-section of Nome's rich musical talent. 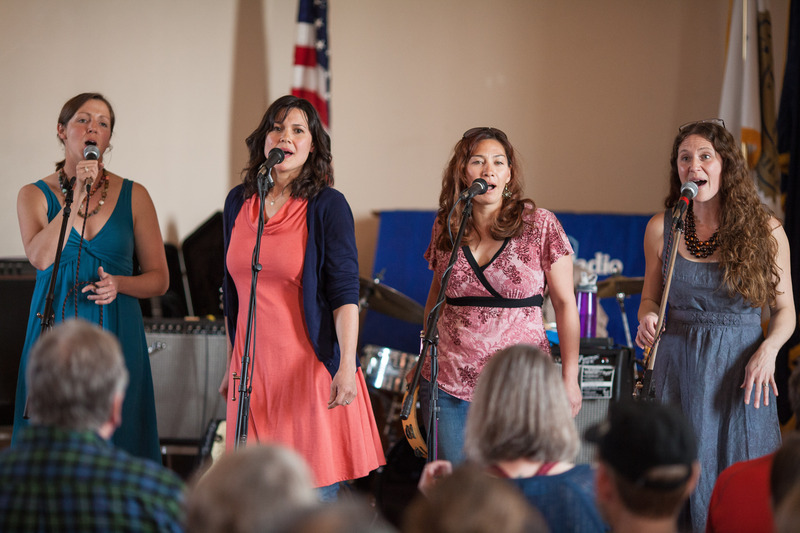 Organized by Sarah Hofstetter – a professional musician, small business owner, and KNOM fan – The Concert for KNOM brought together Nome residents for a night of musical performances and auctions. 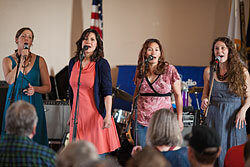 All of the musicians' time and the auctioned goods were donated, and all proceeds went directly to our mission. In just one night, we raised $5,385, pushing us closer to the goals (described on page 1) for the Tom and Florence Busch Digital Studios. 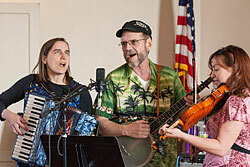 Photos at left: general manager Ric Schmidt welcomes Nome residents to the concert; longtime community DJ Lance Johnson energetically officiates an auction for a gourmet dessert; Nome old-time music ensemble Landbridge Tollbooth, featuring Carol Gales, Jim Dory, and Anahma Shannon; Nome ensemble One Voice, featuring KNOM's own Laura Collins, Bridie Trainor, Anahma Shannon, and Sarah Hofstetter, as well as Caleb Weaver and fellow KNOMer David Dodman (not pictured); musician Jim Abbott performs as part of the Nome rock 'n' roll band The Usual Suspects. We thank everyone who contributed to make this incredible community event a success! As we all came into this world with nothing, everything we have is a gift. 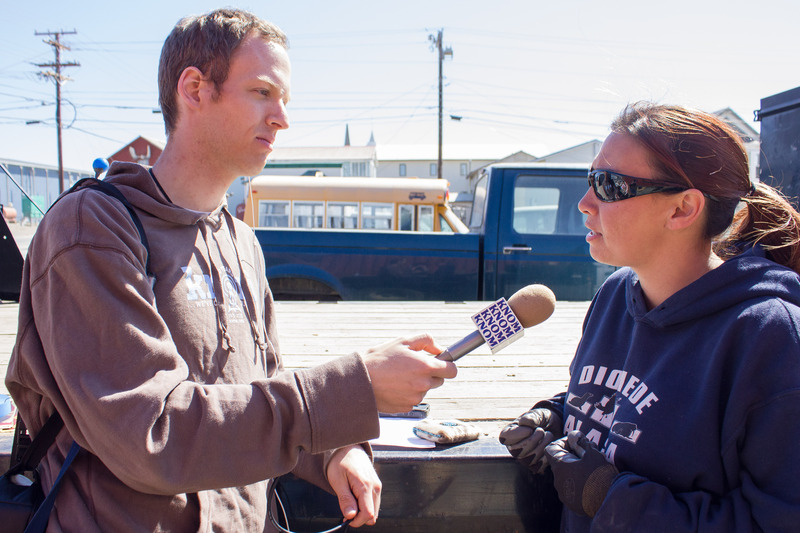 By the time you read this, the president of the KNOM Radio Mission Board of Directors, Father Ross Tozzi, will be on an extended leave of absence from Nome. He'll be traveling to Indiana to attend a special "mini-sabbatical" that, as Fr. 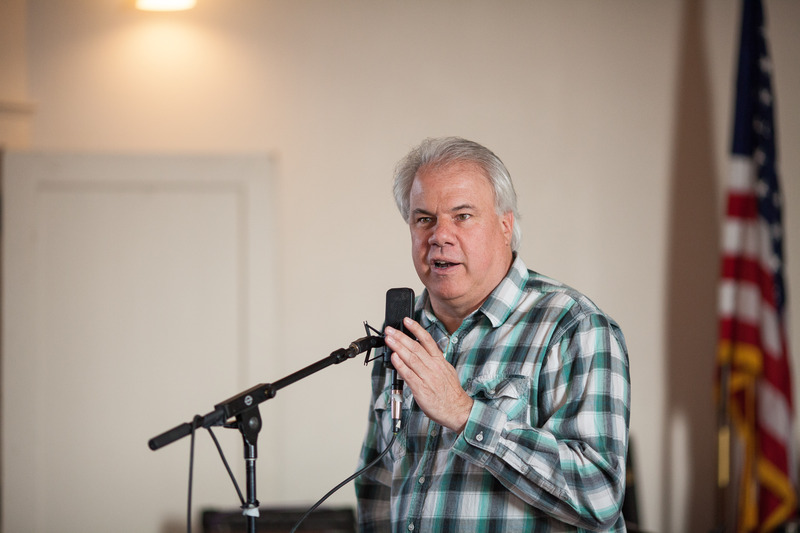 Ross describes, helps priests "recharge their spiritual life, refocus their priorities, and refresh their ministry." Fr. Ross, a former KNOM volunteer as well as pastor at Nome's St. Joseph Catholic Church, will turn over many of his duties to Deacon Bob Froehle, who was ordained last November and who also serves as secretary of the KNOM Board of Directors. 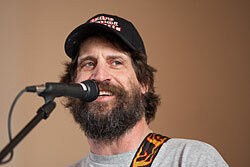 Deacon Bob will preside at daily communion services, make visits to Nome's correctional center, and more. 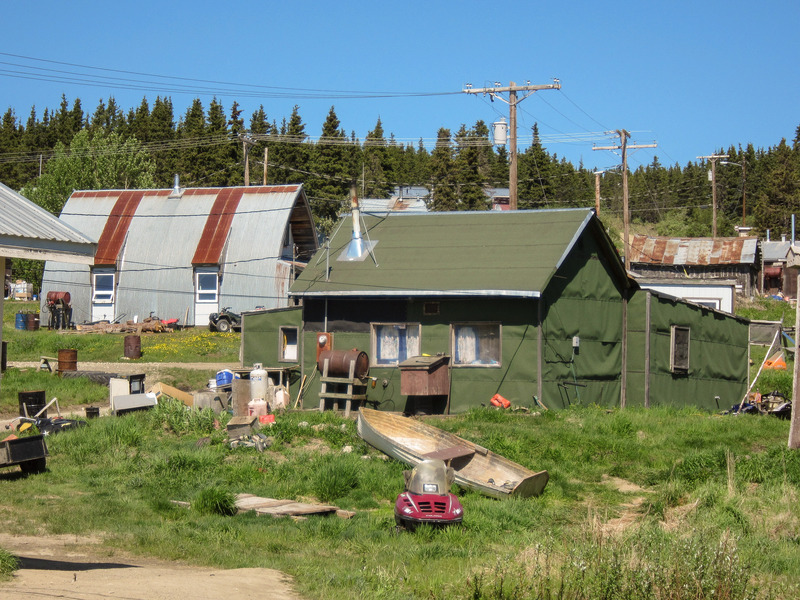 Waste management and trash disposal are just two of a myriad of challenges that Western Alaskan communities face. Because of the isolation of our region – none of the villages or towns in our listening area are connected to the road system – even simple services like recycling are either greatly limited or simply unavailable. 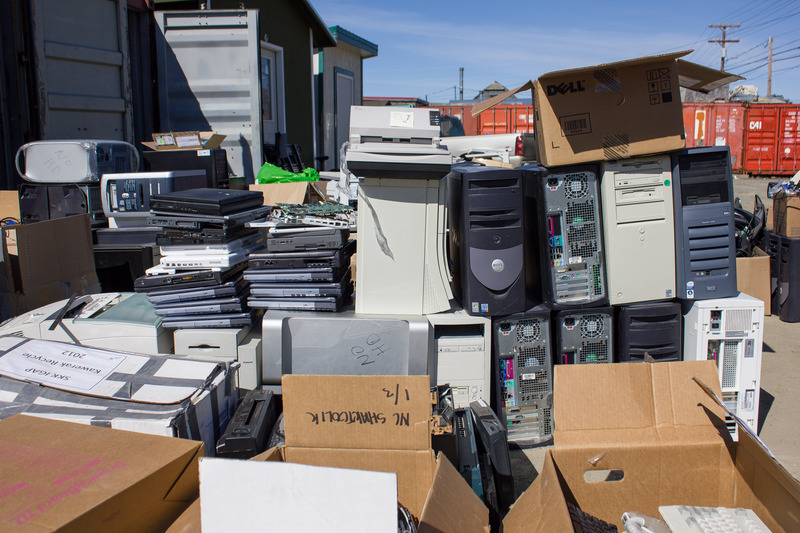 In June, however, KNOM was proud to take part in a second annual initiative to responsibly recycle e-waste: trash that's made up of discarded computers, cameras, and other electronics. Discarding these items present unique challenges, since they typically contain chemicals that can cause long-term harm to the environment; unlike most trash, e-waste can't simply be sent off to the city dump. 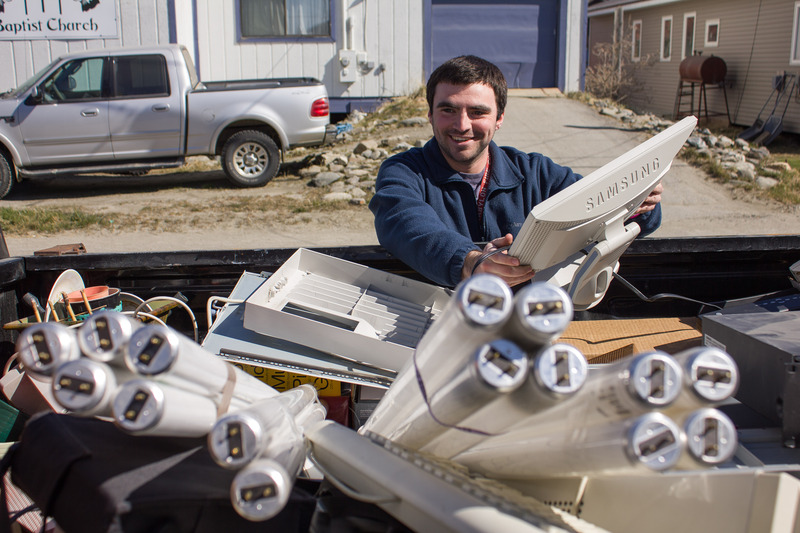 A Western Alaskan tribal organization headquartered in Nome – Kawerak (kuh-WEAR-ick), Inc. – sponsored the drive to collect e-waste and safely transport it to Seattle for proper recycling. Just as we did in 2011, KNOM responded enthusiastically to Kawerak's effort. 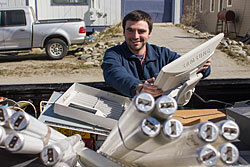 Our staff (including volunteer Matty Guiffré, pictured at top) helped transport all of our station's electronics that had failed beyond repair. 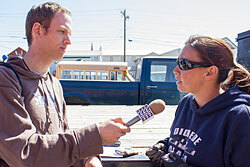 KNOM also supported the e-waste drive on the air with live reports from the collection site: including an interview (as pictured) between reporter Ben Matheson and Kawerak's Anahma Shannon, who organized this year's collection. As seen in the bottom photo – taken just a few hours after the drive began! – Nome had a lot of e-waste to discard. Thank you so much for enabling us to support these community efforts. We conclude with great news. As you may have read in the June Static, we've just installed new power management equipment (dynamic carrier control, or DCC) at our AM transmitter. We're thrilled to report that, in the first electricity bill after the installation, power usage had dropped by 25.6%! We estimate the equipment will pay for itself in just five months.